We all know what Rosie the Riveter looked like, and what she stood for. Ford-era production line labor — and the rise of powerful unions — left us indelible portraits of work in mid 20th century America. Before that, Dickens created searing portraits of labor in the proto-industrial era, as Millet and his followers recorded a vivid picture of agrarian labor in mid 19th century Europe. But what does work look like today in a global economy marked by outsourcing, rapid migration, disruptive economies, and a state of labor that seems fractured, precarious, and almost invisible? 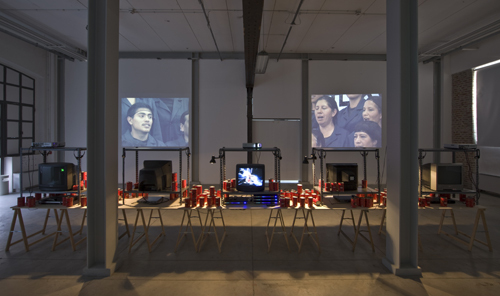 With video, sculpture, photography, and performance art from 25 artists, this exhibition examines the way labor is represented today (and how some contemporary workers choose to represent themselves). The timing, and the place, could not be more fitting: Once the site of a bustling factory itself — whose closure in the face of intense international competition left nearly a third of it’s community out of work — MASS MoCA is perhaps uniquely positioned to present this timely show. The history of North Adams’ workers mirrors that of many in the United States and abroad today who have lost a way of life to the perennial hunt for cheaper labor, even while the low-wage workers who replaced them have just begun to organize for more rights and better working conditions. The exhibition will include nearly 40 works by 25 emerging and established international artists including Claire Beckett, Osman Bozkurt, Camel Collective, Mircea Cantor, Almudena Carracedo and Robert Bahar, Susan Collis, Vicky Funari and Sergio De La Torre, Jason Dodge, Sam Durant, Harun Farocki, Yevgeniy Fiks, Anthony Hernandez, Oded Hirsch, Hugo Hopping, Emily Jacir, Laboratorio 060 with York Chang, Mary Lum, Yoshua Okon, Adrian Paci, Jaume Pitarch, Oliver Ressler, Stephanie Rothenberg, Tyler Rowland, Allan Sekula, and Santiago Sierra. Camel Collective, Laboratorio 060, Mary Lum, and Santiago Sierra are all creating new work for the exhibition. North Adams-based Lum will present an installation made with fragments from the bottom of ordinary paper bags will travel across the wall of the gallery like workers exiting or entering a factory. Camel Collective’s new work draws on imagery from archival photographs of the 1970 strike at Sprague Electric Company and ruminates on the worker as an image subjected to a historical process of abstraction as well as an image-maker. Laboratorio 060 will also engage MASS MoCA’s past and the experiences of former local union members (including several who currently work at the museum) to consider both past failures and future possibilities for organized labor. Sierra, long known for his provocative work on the subject of labor and economic and power relations, will stage a performance featuring a U.S. soldier, perhaps the most invisible of at-risk workers. In conjunction with The Workers MASS MoCA curator Susan Cross has invited Bureau for Open Culture — a nomadic contemporary arts program directed by curator and art historian James Voorhies — to inhabit one of the museum’s buildings for the first four months of the exhibition. Set within a previously unused industrial building on the grounds of MASS MoCA, Bureau for Open Culture presents I Am Searching for Field Character, an exhibition series of public conversations, performances, installations, and workshops with a slew of visiting artists, writers, designers, and thinkers, a well as a beer garden which operates every Thursday and Friday night between May 26 and September 30. MASS MoCA will publish a catalog in conjunction with the exhibition featuring a central essay by Andrew Ross, Professor of Social and Cultural Analysis at NYU and author of Nice Work if You Can Get It: Life and Labor in Precarious Times, in addition to texts by the co-curators of the exhibition, MASS MoCA curator Susan Cross and artist Carla Herrera-Prats, as well as artists and activists Vicky Funari and Sergio De La Torre; filmmaker and Williams College Professor of Art, Liza Johnson; labor historian and MCLA Professor of Sociology, Maynard Seider; and curator and Director of Bureau for Open Culture, James Voorhies.